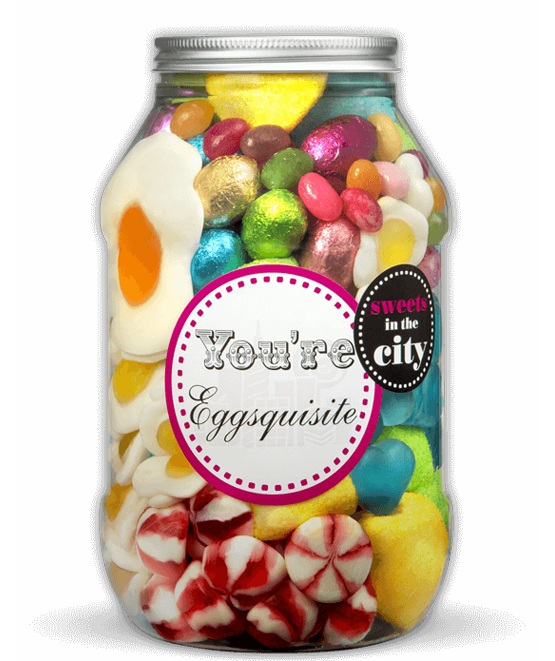 Know someone who adores egg sweets? 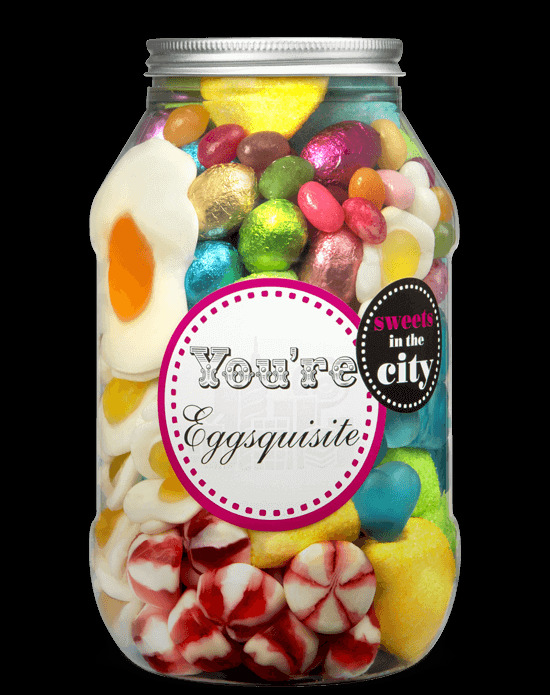 Remind them how Eggsquisite you think they are with these fun egg themed sweets. A fantastic sweet Easter alternative that's sure to put the "spring" firmly in your step! These deleicious egg sweets will delight anyone with a sweet tooth. Send a more unique Easter gift with this Jar of Joy. Product 1: Glucose-fructose syrup, sugar, water, beef gelatine, humectant: sorbitol; flavourings, colour: E100, E133. May also contain MILK. Product 2: Glucose syrup, sugar, dextrose, gelatine, citric acid, flavourings, fruit and plant concentrates (elderberry, lemon, mango, orange, passion fruit, safflower), glazing agents, beeswax and carnauba wax). Product 3: Glucose syrup, sugar, gelatine, humectant: sorbitols; modified potato starch, acid: lactic acid; natural flavouring, vegetable oils (coconut, palm kernel), glazing agents: carnauba wax, beeswax; fruit and vegetable concentrates (paprika), colours: E120, E160a. Product 4: Glucose syrup, sugar, water, pork gelatine, modified starch acids, lactic acid, citric acid, coating agents, vegetable oils (palm, coconut), beeswax, carnaubba wax, flavouring, colours, E100, E129. Warning: E129 may have an adverse effect on activity and attention in children. Product 5: Glucose syrup, sugar, beef and pork gelatine, corn starch, humectant: sorbitols; acids: lactic acid, citric acid; modified potato starch, gelling agent: pectins; flavourings, fruit and vegetable concentrates (radish, tomato, apple, pumpkin, carrot, blackcurrant), coconut and palm kernel oil, glazing agents: beeswax, carnauba wax; colours: E120, E171. Product 6: Glucose syrup, sugar, dextrose, gelatine, acid: citric acid; flavouring, fruit and plant concentrates: spirulina, apple: glazing agents: beeswax, carnauba wax; invert sugar syrup. Product 7: Sugar, palm oil, whey powder (MILK), reduced fat cocoa powder, emulsifier: Soya lecithin, sorbitan tristearate; natural vanilla flavouring.